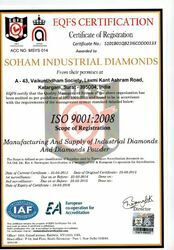 Established in the year 1992, we, "Soham Industrial Diamonds", an ISO 9001: 2008 certified company, are a reputed firm, engaged in manufacturing, supplying and exporting Diamond & Diamond Powder. Our range consists of Synthetic Diamond Powder, Synthetic Diamond Micron Powder, Natural Diamond Powder, Natural Diamond Micron Powder, Synthetic Natural Diamond Powder, Natural Micron Diamond Powders,Process Round Diamond Powder, Brutted Process Round Diamond, Natural Process Crystal Diamond, Process Round Diamond, Process Stick Diamond, Elongated Process Stick Diamond, Single Point Diamond, Synthetic Natural Diamond and many other products. All our products are processed from best quality diamonds that are obtained from the mines. The products we offer are widely appreciated for their excellent thermal conductivity and purity. Further, we provide all our products to the clients in qualitative packaging, so as to ensure safe transits. We are greatly supported by a team of diligent professionals for carrying out all the activities of our trade process. The experts of our firm are sincere, dedicated and capable of completing even the tough targets with perfection and on-time. With the joint efforts of our teammates, we regularly fulfill the needs of a large number of customers. All our experts carry out their tasks at their specific unit in the infrastructure. Sprawling over an extensive area of land, our infrastructure makes it possible for the experts to accomplish their assigned tasks in a remarkable way. Our entire range is made at the sophisticated manufacturing unit with the use of latest machines and tools. Further, the developed products and procured raw material in the form of diamond is kept by us in an arranged and secure manner at the spacious warehousing unit. The warehousing unit of our firm is properly linked with varied shipment modes, due to which we are able to maintain a glorious record of providing scheduled delivery of goods at the clients' end. Before the final delivery, all our products are examined with the use of latest instruments at their specific unit so that only flawless products are delivered to the patrons. Due to our ethical business policies, hardworking workforce and ultra-modern infrastructure facility, we have mustered numerous loyal patrons for ourselves, based in different parts of South/West Africa, East Asia, North Europe and many other nations & continents. Our organization was started by 'Mr. Gajipara Govardhan K. Patel' and managed by 'Mr. Haresh Bhai', who has years of experience and detailed knowledge of the market. His vibrant leadership qualities, business acumen and charismatic managerial skills have enabled us to win the trust of a large number of patrons. Manufacturing and Trading of Diamond and Diamond Powder. For having smooth production and post-production of offered Diamond & Diamond Powder, we have developed a state-of-the-art infrastructure facility. This facility is divided into different sections including manufacturing, quality testing and warehousing & packaging unit to have trouble-free working. All our products are processed using latest diamond cutting, polishing and finishing machines at the sound manufacturing unit. Every machine of our firm is regularly lubricated and upgraded, so as to retain an excellent production rate. After the completion of production process, all the developed products are kept by us away from dust in a safe manner at the sophisticated warehousing unit. Further, our packing experts use latest machines and qualitative material at their specific unit to pack the offered products. To look after systematic execution of all the activities that are taking place within our infrastructure, we have hired a team of deft experts. Manned by a team of sincere and efficient personnel in all the trade stages, we have been able to become a challenging competitor for other enterprises of the market. Our experts utilize their detailed knowledge and industry experience to bring a remarkable product range for the clients. These experts work in close sync with one another to attain the organizational targets in a dexterous way and within the deadline. Further, we periodically conduct extensive training sessions and workshops regarding the domain updates and changing market dynamics.